At nine PM, the sheriff called to inform us that they were calling off the search. It was too dark. Too dangerous. They would send out more people in the morning to resume looking for my brother. But I knew it was too late. I hung up the phone. Crawling under the covers, I closed my eyes and wished with all my heart that I didn’t have to live this moment. That I didn’t have to believe what was happening. It hurt too much. I didn’t want to breathe, didn’t want to think, didn’t want to live. I wanted to open my eyes and see my big brother, home and safe. As I lay there, trying vainly to block out the thoughts that pressed on me, I became aware of music playing from my mom’s iPod. 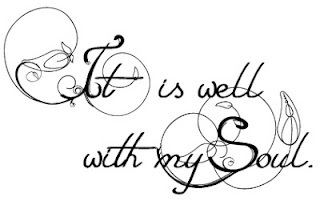 It is well with my soul. He is God in control. I know not all His plans. But even so, it is well. It is well. Those words struck me. I remember thinking, How can it be well with my soul? My brother is either dead or freezing somewhere out there! How can I say it is well? God never promised that life would be easy. Rather, He said the opposite. He tells us that life will be hard if we follow Him. But He does promise to give us the grace and the strength to persevere. If it is truly well with our soul, we ought to be able to say that in good times as well as bad. The wellness of my soul isn’t dependant on circumstances. It is because, despite the circumstances, I know beyond a shadow of a doubt that God is there for me. That He has forgiven and redeemed me. That He loves me, and will always do what’s best for me. Even if it hurts. I really really *really* needed to hear this today. How easy it is to despair in the hard times. But praise God for He is so faithful. So good. Thank you for this post, it blessed me immensely.